This photo, of the 8,000th whale to be listed the North Atlantic Humpback Whale Catalog database at Allied Whale, was taken in November 2013 off Tromso, Norway, by Audun Rikardsen of Arctic Coast Photography. 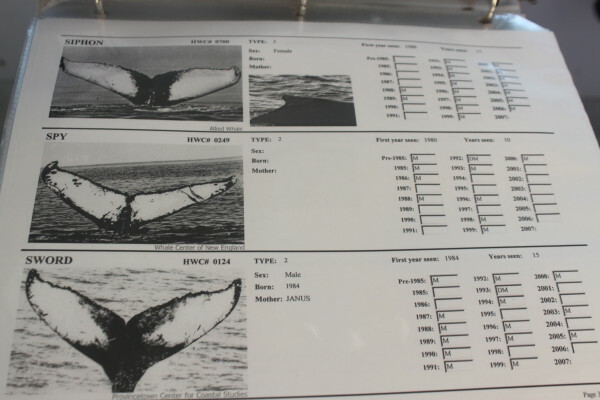 Allied Whale, the marine mammal research arm of College of the Atlantic in Bar Harbor, created the research database in 1977 has has curated it ever since. 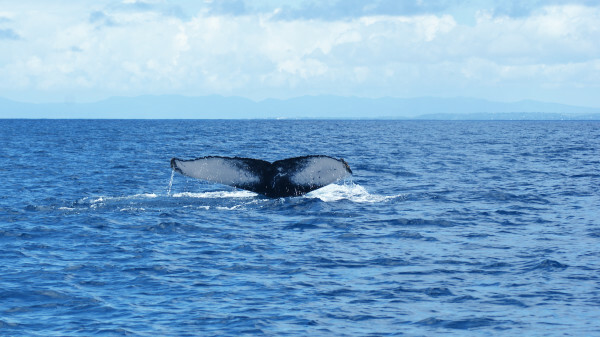 This photo, of the 8,000th whale listed in the North Atlantic Humpback Whale Catalog database, was taken in April 2010 off the Caribbean island of Guadeloupe by Sandra Pedurthe. The Allied Whale "Humpback Whale Catalogue of 2007" is on display in the cabin of the Osprey, College of the Atlantic's research vessel that started offering whale-watching tours during the summer and fall of 2013. The catalog identifies thousands of humpback whales by distinct patterns on their tails. BAR HARBOR, Maine — You could call it Facebook for humpback whales. But this particular database, of all the known humpback whales in the North Atlantic Ocean, is a lot older than any online social media service. It was first started in 1977 by students and faculty at College of the Atlantic and, just recently, added the 8,000th member to its list. The purpose of the North Atlantic Humpback Whale Catalog is to help researchers keep track of and assess the health of both individual whales and the species’ overall population in the North Atlantic. Humpback whales are listed as endangered under federal law and, like all whale species, are legally protected in order to try to get their numbers to rebound. According to officials at Allied Whale, the marine mammal research arm of COA, fewer than 2,000 humpback whales were estimated to be in the North Atlantic 37 years ago, when the college published a slim volume of black-and-white photographs of 120 humpback whales in the North Atlantic that had been taken by researchers. Now, the catalog contains about 32,500 images and other types of records, including two photographs of the most recent whale added to its ranks. The humpback was photographed in April 2010 in the Caribbean off the island of Guadeloupe and then again in November 2013, 5,000 miles away off the northern coast of Norway. A distinctive white mark that runs diagonally across its fluke, or tail, is visible in both photos, identifying it as the same animal. For nearly 40 years, data has been collected and then entered into the catalog by hundreds of researchers and mariners on all sides of the North Atlantic — from the Caribbean, up the East Coast to Greenland, to the Russian arctic and south to the Cape Verde islands off the west coast of Africa. Information in the database has been instrumental in calculating the latest best estimate for the population of humpbacks in the North Atlantic, which is now believed to be around 11,500, according to Peter Stevick, a 1981 graduate of COA and senior scientist at Allied Whale. Stevick said that by keeping track of where and how often individual whales are sighted, the catalog provides researchers with an overview of the migratory behavior of humpbacks in the North Atlantic. 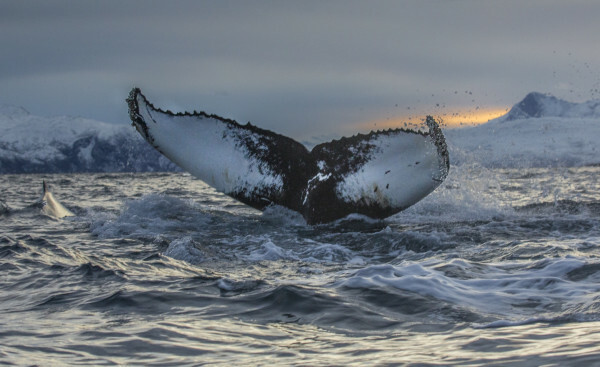 This enables scientists to put sightings of humpbacks into context when developing estimates for the regional population and how that population has changed since the mid-1960s, when the first protections for humpbacks and other whales were put in place. “It was a revolution in whale research at the time,” Stevick said in a prepared statement about the creation of the database in 1977. The fact that, 37 years later, it contains information on 8,000 individual whales would have been “inconceivable” to the small group of people who created it, he added. The catalog should not be confused with a count, or even a partial count, of the current population, according to Stevick. He said that though whales can live for decades, there undoubtedly are whales that have been documented in the catalog that have since died without detection by researchers. For that reason, the catalog functions primarily a historical record, from 1977 to the present, of the behavior and health of individual whales, and as a fluid representation of the population as a whole, according to Stevick. He said it would be irresponsible to randomly speculate on how many whales in the catalog may have passed away since its creation. A humpback sighting this week illustrates Stevick’s point. A whale known as “na1330,” was seen and identified on Friday, Oct. 25, for the first time since 1978, he said. “Many of the whales that were identified in the 1970s continue to be seen,” Stevick said. The catalog is used often to try to identify humpbacks seen off Maine’s coast. Allied Whale staff looked in the catalog in 2012 for photos of a dead humpback calf that had washed ashore on Little Cranberry Island. No photos of it were found in the catalog, but Allied Whale staff contacted other researchers and whale watch companies to see if they might have photos, which could have helped identify its mother and its age. Last month, the catalog was used to identify a humpback whale entangled in fishing gear that a whale watch boat spotted off Mount Desert Island. Photos of the entangled whale showed markings that matched those of a humpback known as Spinnaker — a frequently sighted, 40-foot female believed to be approximately 11 years old. Spinnaker was freed from the fishing line. COA officials have said that if and when Spinnaker is photographed again, the images could be useful in determining whether the entanglement may have affected its long-term health — and will be added to the catalog.